The Origins of the Star, Pentacle, Pentagram | The Pagan & the Pen ~ An Online Magazine! 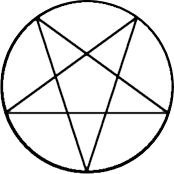 The star , known as a Pentagram or Pentacle, has come to have great meaning and power over the decades to both Pagan and others. It has remained, regardless of religion, in some way or form. But where did it surface from? What does it mean? And what does it continue to stand for? The star itself can be traced back to Ancient times as nearly every culture laid claim to it. The Goddess Kore, who was worshipped by the Pythagorean mystics knew that if you cut an apple crosswise, it revealed the star in its center marked by her sacred seeds. Some ancients called it the star of Ishtar, of Isis, of Nephthys. While in some cultures it meant life and health, in Egypt, it came to represent the underground womb. And even still, from there it’s uses and purposes grew. In Babylon, they were famous for drawing the star on pots and pottery invoking its power to help preserve what was in them. Even those of biblical times, adapted the power of the star as being the first holy sign of their seven seals. Why even King Solomon’s legendary magic ring was made of a star. While the upright star also symbolized the Goddess, it brought protection and knowledge. While Christians today will make the sign of a cross over their chest, Ancient Pagans would make the sign of the pentagram over theirs. Start at the left breast, then to forehead, then right breast, then left shoulder, right shoulder, then end it at the left breast. This symbolized not only protection but completion. Over time, though, the meaning of the star changed, and even today, many Pagans and non-Pagans forgot it’s origins. We have been taught to fear the star, especially when we see it represented in this way. But in Ancient times, the upside down star simply represented the God. It especially became popular when a man was placed in the center, calling him “He of the five shapes.” Also known as the horned God, representing four horned and sacred animals: the bull, ram, goat, and stag. The fifth shape was that of a man. This was adapted by Satanists sometime later, and then the stereotypes and fear grew from there for whatever reason. (Usually misrepresentation, lack of knowledge, or speculation.) But back in the day, the Horned god nor the upside down star ever represented anything evil or frightening. Sadly, though, even today, many Pagans do not know the origins of the upside down star. A perfect example– I did a newsletter some odd years ago, using a piece of Royo art to set it off. The warrior woman had on a necklace with an upside down star on it. To me, the woman represented the Goddess and the star, the God. But sure enough I was slammed with angry and offended emails wondering why I would shatter the image of Paganism by using something so evil as the upside down star. They represented the union of the God and the Goddess joining. This symbol was often used in marriages between Pagans, as in some cultures, the woman represented the Goddess, and the man, the God…so by bringing them together, they each represented the sacred union and joining of both. 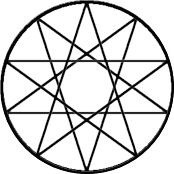 This, nine pointed star has also come to mean the Tree of Life, or the moon inside the tree of life. It represents balance, guidance and inspiration. It symbolizes completion, eternity, as well as nine being a popular number in Ancient times. From the Ancient Egyptians, to the Celts, the star was held high and kept close. from story to legend, to family crest, the star made its mark. Gawain was said to carry the pentacle as it was painted on his shield–representing Morgan. Hermetic Magicians used the star within their model of man because from Ancient to previous times, the star meant, among other things,….knowledge. Those of law enforcement move behind that of a star. Many flags– American, Iraq, Australia, and more show stars. Why, one of the most popular decorations right now happens to be the Primitive Star. I can’t drive through a neighborhood without seeing a gazillion of them hanging on people’s homes. From Barns, to weather vanes…the star has survived the test of time…and for those who make note of them in your life, maybe they will give you a deeper meaning, now that you know some of their grand origins. Phew! Enjoyed that but need to go back over and read again. Thanks, great article. Enjoyed this very much. But you KNOW I am a fan.